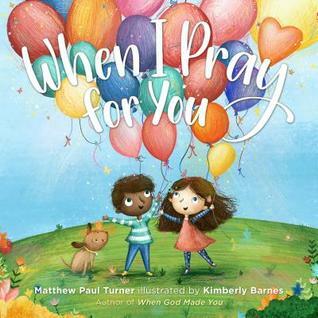 When I Pray for You by Matthew Paul Turner is a beautifully written and illustrated book for children. A prayer for one’s child as it grows up is one that is much needed. It was sweet and inspiring. This book showed a mother’s love for her child throughout the pages. It was hard not to love this story. The words and prayer over a child filled me with a lot of emotions. A parent’s love in this book was deep, heartfelt, and powering. It could be seen on each illustrated page. The illustrations were bright and colorful; easy to follow along. Parents can easily enjoy reading this to their children. As they too, want their child to experience safety, love, and joy each and every day. No matter how big they grow that love never diminishes. And neither do the prayers. Overall, I loved reading this book. I recommend it to all parents.